Today, the energy drink market is one of the most lucrative in the beverage industry, but long before the likes of Red Bull and Monster were surging through our bloodstreams, a certain crimson red can of super-caffeinated cola called Jolt was the go-to carbonated drink for night-owls, Atari addicts, and computer geeks in the '80s and early '90s. And while energy drinks have grown more potent since Jolt disappeared from store shelves, it looks like you'll be able to pump yourself full of the retro OG fuel again now that Jolt is making a big comeback this month. Been a minute. What'd we miss? 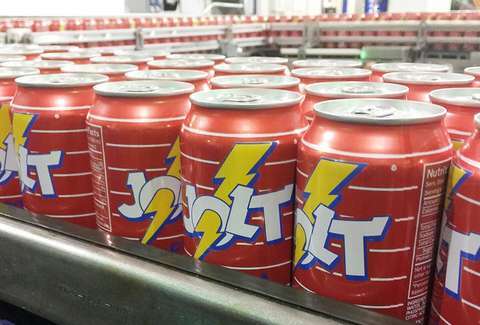 Jolt is just the latest '80s- and '90s-era cult favorite product to make comeback, joining Zima, Crystal Pepsi, and even the original NES and SNES consoles. New 16oz cans of the amber-colored energy drink will be available exclusively at Dollar General stores, and probably eBay in the near future. Launched in 1985, Jolt Cola's slogan "all the sugar and twice the caffeine" made it a big hit with anyone looking for a quick boost, and became particularly popular among the '80s gamer and hacker crowd. Throughout the years, it went through a series of rebrands, but failed to hang onto its popularity (remember those battery cans?). Now, the brand is going back to its roots with a return to the old-school style can, logo, and the original formula, which contains 50g of sugar and 160mg of caffeine (over three times as much as you'll find in a similar sized Coke). As of now, Jolt is only scheduled to be on shelves for a year, so stock up now before they're gone for good. If you're lucky, you might even find yourself settling in for a night of old-school video games.